Superficial acral fibromyxoma (SAF) is a rare, distinctive benign soft tissue tumor with a predilection for the hands and feet. It often involves the fingers and toes, with the big toe being most frequently affected. To date, there is only one case that has been diagnosed on cytological features. We herein report a case of SAF primarily diagnosed by fine needle aspiration cytology (FNAC) and confirmed by histopathological study. A 27-year-old healthy female presented with an asymptomatic, globular swelling over the right great toe since 2 years. Examination revealed a 2 cm ×1 cm ×1 cm hemispherical firm, non-tender nodule in the subungual region with no involvement or deformity of the nail plate [Figure 1]. Fine needle aspiration (FNA) yielded mucoid material, which showed benign plump oval to spindle cells arranged in groups, sheets and cohesive clusters in a background of myxoid material with interspersed thin-walled capillaries. The cells had indistinct cytoplasm and blunt oval to spindle-shaped nuclei [Figure 2]. With these, a diagnosis of SAF was suggested and an en block excision biopsy was performed and subjected to histopathological examination. Grossly, the specimen consisted of a skin-covered tissue, which on cut-section revealed a well-circumscribed grey-white lesion in the subcutis. On microscopy, there was a hyperkeratotic epidermis and a dermal tumor composed of spindle and stellate cells with random, loose storiform and fascicular patterns that were embedded in abundant myxocollagenous stroma that showed Alcian blue positivity [Figure 3]. The cells showed no pleomorphism, mitotic figures or atypia. These features confirmed the diagnosis of SAF. Characteristically, tumor cells show positivity for vimentin, CD-34, CD-99, EMA and CD10 and are negative for S-100 protein. ,,, Expression of nestin (a marker of multipotent stem cells) or CD-10 (co-expressed by mesenchymal cells in the nail unit) points to the cell of origin as being either the multipotent dermal stem cells or the mesenchymal cells in the nail unit. , In an ultrastructural study by Pasquinelli et al.,  the tumor cells were found to be composed of cytoplasmic intermediate filaments and numerous cisternae of rough endoplasmic reticulum, confirming the fibroblastic nature of the tumor cells. Malignant behavior or metastasis has not been reported, but the tumor may persist or recur if inadequately excised. It is observed that all recurrent tumors have positive margins on initial biopsy or on subsequent excision. A pre-operative correct diagnosis of SAF by FNA cytology is thus essential to plan a complete surgical excision that avoids further recurrence. The differential diagnosis for SAF includes myxoid neurofibroma, fibroma of tendon sheath, glomus tumor, superficial angiomyxoma, acral fibrokeratoma, sclerosing perineuroma, cutaneous myxoma, myxoid fibrous histiocytoma and dermatofibrosarcoma protuberans. SAF is not widely recognized because of its uncommon occurrence. Awareness of this entity is helpful in distinguishing this lesion from other myxoid soft tissue tumors and in proper management of these cases. The authors would like to acknowledge the HOD, Department of Pathology, JSSMC, JSS University, Mysore. 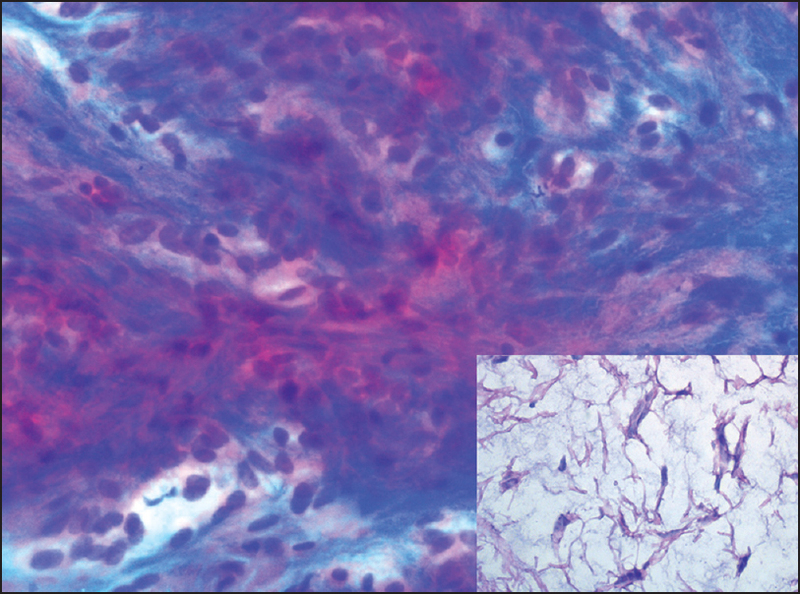 Fetsch JF, Laskin WB, Miettinen M. Superficial acralfibromyxoma: Aclinicopathologic and immunohistochemical analysis of 37 cases of a distinctive soft tissue tumor with a predilection for the fingers and toes. Hum Pathol 2001;32:704-14. Misago N, Ohkawa T, Yanai T, Narisawa Y. Superficial acralfibromyxoma on the tip of the big toe: Expression of CD10 and nestin. J Eur Acad Dermatol Venereol 2008;22:255-7. Sinha A, Phukan JP, Bandyopadhyaya G, Sengupta S, Saha R. Superficial acralfibromyxoma: Arare tumor diagnosed by cytology. Iran J Pathol 2013;8:59-63. Ashby-Richardson H,Rogers GS,Stadecker MJ. Superficial acralfibromyxoma: An overview. Arch Pathol Lab Med 2011;135:1064-6. Goo J,Jung YJ,Kim JH,Lee SY,Ahn SK. 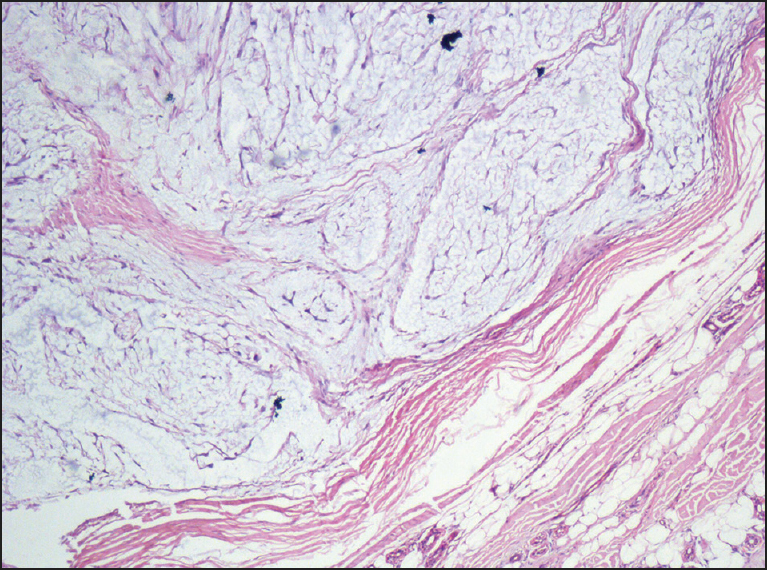 A case of superficial acralfibromyxoma. Ann Dermatol 2010;22:110-3. Wakabayashi Y, Nakai N, Takenaka H, Katah N. Superficial acrafibromyxoma of the great toe: Case report and mini-review of the literature. Acta Dermatovener Cr 2012;20:263-6. Meyerle JH,Keller RA,Krivda SJ. 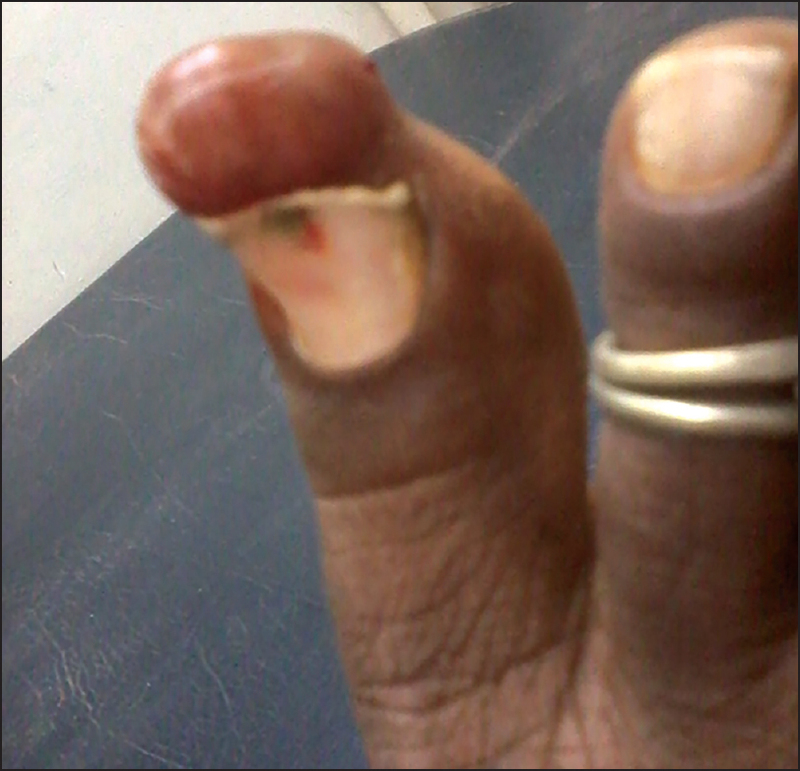 Superficial acralfibromyxoma of the index finger. J Am Acad Dermatol 2004;50:134-6. Lee KJ,Kim WS,Lee JH,Yang JM,Lee ES,Mun GH, et al. CD10, a marker for specialized mesenchymal cells (onychofibroblasts) in the nail unit. J Dermatol Sci 2006;42:65-7. Toma JG,McKenzie IA,Bagli D,Miller FD. Isolation and characterization of multipotent skin-derived precursors from human skin. Stem Cells 2005;23:727-37. Pasquinelli G,Foroni L,Papadopoulos F,Dicandia L,Bisceglia M.Superficial acralfibromyxoma: Immunohistochemical and ultrastructural analysis of a case, with literature review. Ultrastruct Pathol 2009;33:293-301.